January is a tough time for most people. With bills flooding in from Christmas spending and high energy prices in winter it’s no wonder the 23rd of January is considered to be the most depressing of the entire year. Having little or no money can be stressful but it’s unlikely to last very long. Tip: If the no money situation is going to last a while consider ways to make extra from part time work to surveys online. For temporary cashflow problems, the following tips can help you get by for a few weeks with hardly spending a penny at all. We all fall into the trap that we must spend lots on food every week, yet 33% of food is thrown away. Look online for very cheap foods that are close to their best before dates. They’re perfectly healthy and will save you up to 95% on the retail price. Set yourself a challenge too to use EVERYTHING in the house. Even if you love meet and two veg everyday you’ll be surprised what meals you can make with what you’ve already got. For instance, I went looking in the freezer, I found leftovers I’d frozen, fish fingers and even pork chops right at the bottom along with a couple of Haggis? The leftovers included a chilli, a chicken madras, pasta bake and homemade ice-cream. Not a bad bounty. When I was little we often had very little money, that is until Mum worked silly hours and Dad’s business boomed. Every piece of furniture had a price tag and it was not unusual for a chair to be sold as you sat on it, or a dining table to be taken during a dinner party. It was a very happy time. My father had a knack of laying his hands on anything. It was always in bulk though. For instance one month we ate shark in garlic butter with almost every meal, another we ate hundreds of MacDonald’s deep fried apple pies. Heaven knows where he got everything from. He also used to lay his hands on crates of tins, without the labels. These gave us some of our best meals. We’d be allowed to choose two but we had to stick with our choices. There was quite an abundance of fruit cocktail and beans and sausages! He always said that as long as you have the staples, flour, eggs, milk and bread you’d never be hungry. This is a tip I discovered when I’d run out of my favourite shampoo. I cut the bottle in half and discovered I had enough for two more applications. I now do this with everything and not just cosmetics. It works for foundation too. For lipstick use a brush to get the colour at the end or remove the remaining stick of lipstick and squidge it into a tiny pot with a lid. It’s exactly the same as how many lip glosses are sold today. 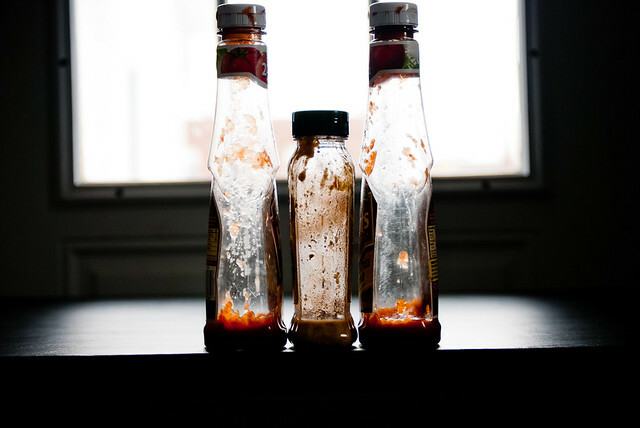 The squeezy bottles of condiments (especially mayonnaise) often have a lot left when they’ve seem to be finished. A drop of vinegar in ketchup, mint sauce, brown sauce and salad cream can make it go a lot further. My aunt had a great tip for improving the supermarket brand range too. Add a sprinkle of sugar to baked beans, they’ll taste just like the leading brands. This can also be done with tinned soups. It’s amazing how much sugar is actually used in processed foods. This time of the year is ideal for a big spring clean. The less things you have, the less time you spend cleaning them. See if you can swap any items or save them until the car boots start. EBay can be a good way to sell but in January everyone’s a little spent out, try other means instead. This sounds as if it’s scrounging, and it is in a way but it can also make you more sociable. For example, I always host lunches or dinners, I prefer friends and family to come to me as cooking is one of my favourite hobbies. We’ve always received invitations in return but never taken them up. This month already we accepted an invite to my mum’s for New Year’s Day. She loved cooking for everyone and we didn’t have to fork out on dinner, drinks and nibbles for the whole family. People can start coming to us again in March.